Back in March, Bethany Shearing, Sales Consultant at our Norwich travel agents in store at Jarrolds, jetted off for a look around Singapore. As you can see, her trip included Shangri-Las, shopping and Singapore Slings. We had a great start to the trip as we were invited into the Singapore Airlines Silver Kris Lounge at London Heathrow T2. The lounge was beautifully decorated and so elegant. There was plenty of food and drink available and lots of comfortable seating areas for guests. Televisions, phone/tablet charging points and children’s play area were all available. We flew economy on both the outbound and return flights and I was so impressed with the standard and service on board Singapore Airlines (definitely one of the best that I have flown with). Flight attendants were polite and nothing was ever too much trouble for them. Snacks such as crisps, chocolate bars, sandwiches, soft drinks etc. were all complimentary throughout the flight – you simply had to ask and it would be brought over to you. There was a good selection of new film releases, television programmes and music on board to help pass the long flight (flight time was 13 hours 10 minutes on the outbound and on the return, it was just over 14 hours). For the first two nights in Singapore, we checked into the Shangri-La Singapore. The hotel was absolutely stunning and I couldn’t fault it in any way. Hundreds of ornate chandeliers and the iconic orchid flowers decorate the whole hotel. It is made up of three wings – ‘tower’, ‘garden’ and ‘valley’. We stayed in the garden wing overlooking the lush gardens and pool area. This is the only wing that offers guests balcony space. Comparing the three wings at the hotel, the tower wing would be the standard room type (offering city or pool views), the garden wing is perhaps more modern, offering extra balcony space for guests and the valley wing is a more exclusive option (heads of states and presidents have all checked into the Shangri-La Valley Wing so this option really is something special). Breakfast at the hotel was delicious. Everything you could imagine was on the menu and the staff and service were fantastic. The hotel is in a good location – about 25 minutes from Changi Airport and about a 15-minute walk from Orchard Road. Although it’s located in the city, the hotel is set in such beautiful grounds you really feel like you are away from the hustle and bustle. An orchid garden was currently being constructed within the grounds and should be completed over the next coming month or so. On the final two nights in Singapore, we stayed at the Park Hotel Clarke Quay. The hotel is located in a good location and it’s about a 10-minute walk to the lively entertainment area of Clarke Quay. It is rated a 4-star option, however, I was a little disappointed if I’m being honest. The rooms were quite small and claustrophobic and the majority of guests were hanging around for long periods waiting for a small handful of sun loungers to become available. Over the three full days we were in Singapore, we had opportunities to visit many properties in the city and on Sentosa Island. Our first site inspection was the 5-star legendary ‘Raffles’ Hotel. Stepping into the hotel, it was like stepping back in time; every detail was so traditional yet still so luxurious. Raffles is popular for an afternoon tea for non-hotel guests (smart clothes for both men and women are compulsory). The hotel offers guests the chance to view the ‘hall of fame’, where pictures of famous guests from throughout the years are displayed. These include the Duke and Duchess of Cambridge, Christian Louboutin, Michael Jackson and George Bush. The next site inspection was the Shangri-La Sentosa Island. Like the Shangri-La Singapore City, I couldn’t fault this hotel as it really had that wow factor and was set on a beautiful beach front. The rooms were clean, modern and had such a relaxing feel about them (decorated in greens, whites and woods). The hotel offers guests a complimentary shuttle service to VivoCity, Singapore’s largest shopping mall (10-minute journey). I was surprised that the hotel caters so well for families. There’s a great kids club complete with a tree house, children’s pool with waterslides and a craft room. Children’s mealtimes are also taken into consideration and there’s a separate area for baby and toddler food. If you’re looking for a twin-centre break, it would be great to experience both of the Shangri-La hotels so you get to explore the city and have some time to relax on the island. Our next hotel visit was back in the city, at the Jen Orchardgateway. This was such a cool and modern hotel, set above a shopping centre on Orchard Road. The main feature is the rooftop swimming pool, which offers views over the city and the Marina Bay area. It is actually owned by the same company as the Shangri-La properties, so the quality and standard of the rooms and facilities are brilliant. Our first morning consisted of the Heritage Foodelicious Tour, offering the chance to try the local cuisine in several different venues – including Chinese, Malay, Indian and Peranakan. First stop was the bustling Geylang Serai market, which serves up mainly Malay cuisine. Walking through the ‘wet’ market, which offers a variety of fish, poultry, fruit and vegetables was certainly an eye opener! The wet market was adopted many years ago when refrigerators were not available, so sellers would use blocks of ice to keep the produce fresh. Here we tried Roti Prata and Thosai (similar to a curry) and a frothy glass of The Tarik (a very sweet hot tea). Next on the Foodelicious tour, we visited a restaurant to taste the famous Laksa. Laksa consists of rice noodles or rice vermicelli with chicken, prawn or fish, served in spicy soup and based on rich and spicy curry coconut milk. A word of caution – ensure there is at least a litre bottle of water available as this really is very, very hot! The next excursion was the Singapore Sling masterclass at the famous Long Bar in Raffles Hotel. We learnt the art of making the perfect Singapore Sling and tasting, of course, was part of the masterclass! This is a great alternative activity, offering something very unique and great fun. We boarded a bum boat to cruise along the Singapore River, taking in famous sights such as Clarke Quay, Marina Bay and the Merlion Statue. We also visited the world famous National Orchid Garden. As orchids are my favourite flower, I was in awe at how beautiful the gardens were and how many different species and colours could be seen. 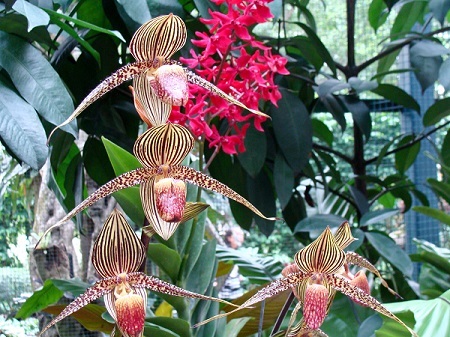 Like at Raffles, the garden housed ‘famous’ orchids, to mark the visit of well-known faces to the gardens. There was a Duke and Duchess of Cambridge orchid and a Princess Diana orchid. Although she never made it to Singapore, a visit from her was scheduled about a month after she passed away and an orchid has been planted in remembrance. Our final day was a day on the island of fun – Sentosa Island. We transferred by cable car and caught the MRT (underground tube service) back to Clarke Quay. It surprised me how well British travellers are looked after. Signs are all in English, locals speak English and so it is very easy to get around in the area and you do feel very safe. 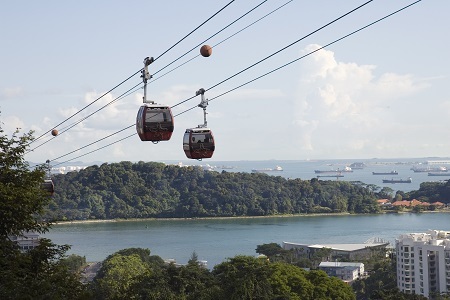 Sentosa Island is home to 10 hotels (including the Hard Rock Hotel and the Shangri-La). It is also where you’ll find Universal Studios, Underwater World (plenty of chances to swim with dolphins), 4D Experiences and Segways. We were lucky to experience the Journey to the Centre of the Earth 4D Experience and also had a ride on the Segways (such fun). The island really caters well to families who want a bit of chill out time from sightseeing as well as some fun. My favourite part of the trip was definitely visiting Sentosa Island. The island of fun was great with so many unique attractions. The cable car is a great way to get across to the island. I loved the Singapore Sling masterclass at Raffles also – such a unique experience. The Premier Holidays trip was the best I have been on. Before going to Singapore, I didn’t actually know an awful lot about the city, but the trip has definitely increased my confidence in selling it. We really got a good feel for the hotels, attractions and the general areas. I would definitely recommend this trip. 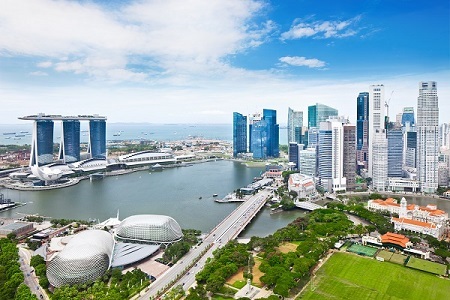 Singapore is a great stop-over location for Australia and New Zealand and also great to be included in tours of Asia. The area caters well for everyone, from those looking for a sightseeing city to anyone looking for a bit of relaxation time on a beach. Shopaholics will also be well catered for – I have never seen so many huge shopping centres in one city. I would like to say a big thank you to Premier Holidays and also the Singapore Tourist Board for their incredible hospitality, knowledge and for the fantastic opportunity to experience this great destination. Must try? A Singapore Sling of course! If you would like to see the sights of Singapore, we can find the perfect holiday for you. Find our travel stores in Westbourne, Dorchester, Lymington, Bournemouth and various places around East Anglia.